From Scotland’s fausse freends like Moore, Murphy and Mundell an unending drone of unsubstantiated guff about all that Scotland benefits from its union wafts north of the border. Its volume and stamp of officialdom beguiles many genuinely uncommitted people to believe them. After all, Britain is one of the world’s ‘big-hitter’ economies and so us wee Scots would be better off staying under its sheltering wing. Wouldn’t we? 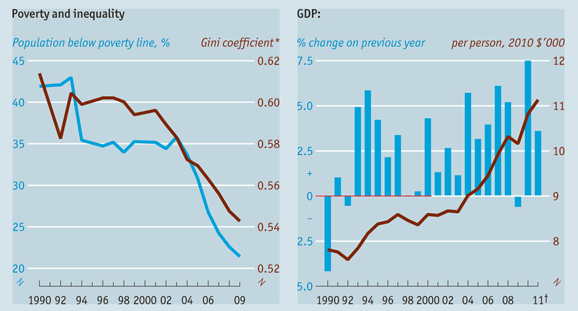 Well, for most of the nineties & noughties, the UK and Brazil grew at comparable rates until the 2008 crisis hit. Since then, Brazil has resumed its 4% p.a. growth while we are struggling to achieve 1%. But much of the UK’s growth in wealth has been channelled towards the really wealthy—it saw a rapid rise in income inequality between the mid-1970s and the mid-1990s. Since then, the increase in the UK has broadly levelled off for most people but those at the very top of the income distribution—fat cat bankers, FTSE100 directors, etc—have continued to accelerate away from everybody else. Not all countries have suffered this socially debilitating effect. According to the Economist, over the last two decades, the poverty rate in Brazil has halved. With this, the Gini coefficient measure of income inequality has also fallen sharply, declining 1.2% a year. Brazil’s economy is forecast to grow by 3.6% this year and Brazil is set to overtake Britain from ninth place to become the sixth largest economy in the world. But it is not just scale, GDP per person, at around $11,000 (or 19,000 reais) has been growing at an average annual rate of 1.7% since 1990; closing the gap with high-income countries like Britain (currently $35, 165). But the key issue is that income growth is faster among the poorest—those in the favelas above São Paulo or scraping a living in the newly cleared forests of the Matto Grosso. While much attention among the BRICs is focussed on China, Brazil is actually achieving comparable per person growth rates and could reach its poverty reduction goal in the next few years. So who should Scotland be taking economic lessons from? Stagnating Britain that has flirted with double-dip recession for the last three years yet allows obscene incomes by the Fred the Shreds? Or dynamic Brazil, not only samba-ing its way away from any recession but mixing up the economic classes the way it has already mixed up its multi-racial heritage to form a more dynamic, homogeneous confident country.